Last night, I visited a good friend who recently had her first baby. It was so awesome to see her snuggling her new bundle of joy. Driving home from Morristown, my mind began to wander toward retro toys from my babyhood -- and of course I had to start Googling as soon as I got home. One baby toy in particular always struck a chord with me -- my little cousins and myself owned one of these nifty musical imaginative toys called the Roly Poly Chime Ball by Fisher Price. This simplistic sphere was appropriate for babies ages 6 months to 4 years. 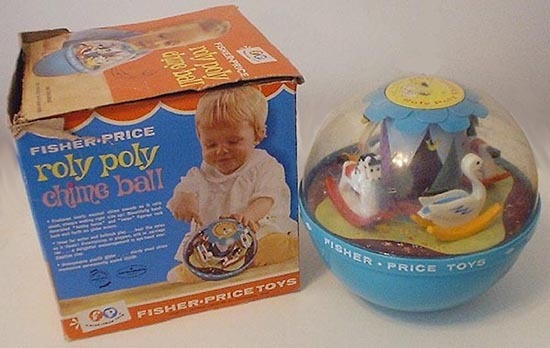 The Roly Poly Chime Ball was first introduced in 1965 and was a hard plastic ball about 7 inches in diameter with a transparent top half featuring miniature rocking horses and a swan. When the ball was rolled, the small toys inside would rock and the music would sound. There were a variety of Roly Poly Chime Balls made -- one came in yellow and had sail boats that would rock. Fisher Price continued to produce and modernize the Roly Poly Chime Ball for over thirty years and ceased production in 1986. For some reason with age, the transparent portion would fog up much like a cracked car headlight. The version I am most familiar with was green or teal and had a teeny-tiny version of my little brother's red, white and blue Fisher Price pony inside. Roly Poly Chime Ball can be found on eBay from $5-$100 depending on he condition. Do you remember this old-school baby toy? Reminds of that pop-pop-pop ball of similar design that kids would push and the little balls inside the clear dome would bounce all over. I so remember a hand-me-down toy like that. I think I used to love to slobber all over the clear non-safe plastic part. Way to go mom and dad. I'm sure I lost a baker's dozen of IQ points from that. That was the perfect toy for smacking sisters on the head with. I never had one myself of course, but my kids sure did. Once again you've activated my memory banks. Man, I remember those! I loved it as a kid and had totally forgotten about it! Thanks for the small trip down memory lane. There were so many fun toys from our youth... although it's hard to believe that we're all still alive and kicking after all of that leaded paint we gnawed on for all those years. I can't say I remember that exact toy, but I do remember others like it. And I certainly remember the pop pop pop ball rolling toy that Wally J mentioned! I think we could all clean out the attics at our parents' places and end up with some great memories, and maybe something that might be worth some money!